Strengthening the work of people’s air defense in general and the posture of people’s air defense in particular serves as our Party and State’s strategy. This is at the forefront of Hanoi’s local military tasks as the capital city is the focal point of people’s air defense. Over the past years, being fully aware of the Party’s military guidelines and under the leadership of the Central Military Commisson (CMC), Ministry of National Defence (MoD), directly the Party Committee, People’s Council and People’s Committee of Hanoi city, the municipal armed forces have been the vanguard of successfully fulfilling assigned tasks, thereby contributing to building increasingly firm all-people national defense, people’s security and defensive areas and facilitating Hanoi’s rapid and sustainable development. The Hanoi High Command has attached considerable importance to the work of people’s air defense in general and the posture of people’s air defense, as evidenced by scores of synchronous measures. As regards the building of the posture of people’s air defense, the municipal armed forces have inherited and developed the air defense force’s anti-aircraft operational art in previous wars of resistance, especially the Air Defense Campaign against the US Operation Linebacker 2 in late 1972. As a result, Hanoians’ awareness of this work has been increasingly heightened while the capital city’s systems of fortifications for people’s air defense have been further consolidated, capable of opportunely and effectively dealing with aerial contingencies and guaranteeing the safety of Hanoi’s airspace. That said, limited awareness remains seen among a section of cadres, enterprises and residents while regulations concerning safety distance and vertical clearance for anti-aircraft warfare have yet to be strictly obeyed in the construction of high-rise buildings. Meanwhile, as an economic, political and military hub, Hanoi is among prime targets of the hostile aerial attacks. Therefore, the municipal armed forces should continue to strengthen their pivotal role on the air-defense battlefield, building Hanoi’s firm posture of people’s air defense to meet requirements of protecting the capital city’s airspace in the new situation. To this end, the Hanoi High Command has made principal recommendations to the municipal authorities on the task of building the posture of people’s air defense. Based on directives and resolutions by the Party, CMC, MoD, especially Decree 74/2015/NĐ-CP, dated September 9th, 2015 by the Government on People’s Air Defense, the Hanoi High Command has counselled the municipal authorities to formulate and issue legal normative documents consonant with capabilities of Hanoi’s relevant agencies and military units pertaining to the task of building the posture of people’s air defense. Those documents prescribe functions, duties and organizational structure of all-level Steering Committees for people’s air defense (hereinafter Steering Committee). The all-level Steering Committees are tasked with concretizing the municipal authorities’ resolutions and directives so as to lay out uniform guidelines for plans for socio-economic development associated with strenghthening the work of people’s air defense on a both short-and long-term basis. In addition, the municipal authorities have devoted attention to raising awareness of people’s air defense among cadres, Party members and residents across the capital city. Hanoi has a dense population from all walks of life with ensued disparities in awareness while negative aspects of market mechanism have led to overestimated economic development and underestimated consolidation of national defense and security, including the building of the posture of people’s air defense. In response, the Hanoi High Command has counselled the municipal authorities to direct defense-security education pursuant to Directive 12-CT/TW, dated May 3rd, 2007 by the Politburo while closely cooperating with relevant agencies in setting out plans for defense and security education on a yearly or termly basis. The content of defense and security education is comprehensive but focalized with emphasis placed on the tasks of safeguarding Homeland and air space in the new situation, plots and artifices of the hostile aerial attacks, the fundamentals of and necessity for people’s air defense, responsibilities for utilizing and protecting fortifications for air defense, lessons in anti-aircraft operational art drawn from the “Hanoi – Dien Bien Phu in the air” in December, 1972. Forms of and measures for education are diverse so as to build political zeal, spirit of “determination to fight”, “readiness to sacrifice life for protection of Hanoi’s air space” and trust in Vietnam’s existing materiel and anti-aircraft operational art, thereby generating remarkable transformations in awaress of and sense of responsibility among cadres, soldiers and residents for the task of building the posture of people’s air defense. The Hanoi High Command has highly valued the building of observatories for air defense alert with focus on targets of strategic importance to opportunely deal with aerial contingencies. Focus has been put on targets of strategic importance. The people’s air defense force has closely combined unaided obervation with the observation aided by advanced materiel from units of Army air defense and national air defense. 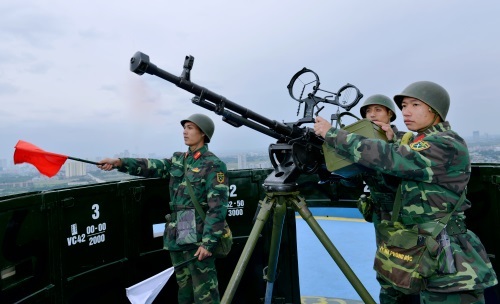 In terms of systems of fortifications for people’s air defense, the Hanoi High Command has directed that they be widespread, continuous and firm consonant with the posture of defensive areas and localities’ capabilities. Systems of fortifications are required to accomodate both soldiers and materiel, including underground bunkers, gun positions (primary, secondary and diversionary ones). The building work is carried out on a step-by-step basis, which means those systems of fortifications are semi-solid in peacetime for combat readiness training and upraded in wartime. Dispositions of long-and short-range weapons are alternate, especially in the main directions of the hostile aerial attacks. When it comes to evacuation centres, the Hanoi High Command has directed its functional affiliates to study realities of recent wars in the world to draw lessons in preventing and retaliating against hostile aerial attacks, thereby making recommendations to the municipal authorities on the planning and building. Evacuation centres are classified as long -term, immediate –term and on-the-spot. Long-term evacuation centres are disposed away from the inner city, even in neighboring provinces. Immediate-term evacuation centres are located in the vicinity of the capital city while on-the-spot evacuation centres are on the periphery of targets subject to hostile aerial bombings. Accordingly, districts and towns are to design plans for evacuation or receiving evacuees to ensure the safety of residents and facilities, enabling evacuees to quickly settle down while gradually building networks of trenches and underground bunkers for evacuees. Plans have also been worked out for safeguarding workshops and factories (such as power plants, water treatment plants), the evacuation of which is made impossible. Thanks to efforts by the municipal armed forces, the posture of people’s air defense in defensive areas in Hanoi has been gradually consolidated to meet the requirements of air defense both in peacetime and wartime.